iCloud Music Library can’t be enabled. You can enable it later from Music in Settings. Until then, your music won’t be available on your other devices. It is reported that this error occurs when either the “Merge” or “Replace” options are selected. 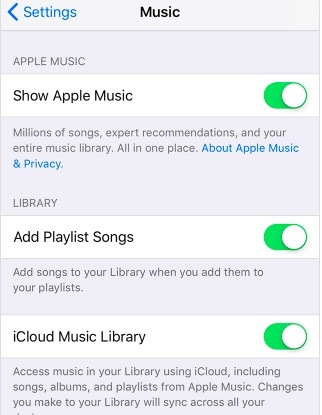 In order to turn on iCloud Music Library, simply go to Settings > Music, and toggle iCloud Music Library on. On your Mac, launch iTunes and go to iTunes > Preferences > and select iCloud Music Library. Make sure that you’re signed in to all of your devices with the same Apple ID. Make sure that you have the latest version of iOS. Go to Settings > General > Software Update. You can update your iOS device easily and wirelessly. Make sure that you have the latest version of macOS. Go to App Store and click Updates. Make sure that you have the latest version of iTunes. Go to App Store and click Updates and check to see if there are any iTunes updates. Restart your device. Different iOS devices require different steps. Read this Apple document. To restart your Mac, choose Apple Menu and click Restart. Go to Settings > iTunes & App Store > [your Apple ID] > and tap Sign Out. Wait a few seconds and then go to Settings > iTunes & App Store and sign back in and now try to turn on iCloud Music Library. 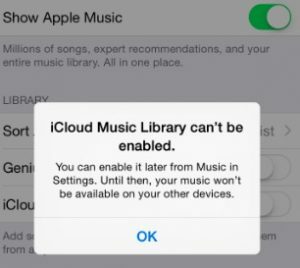 Repeat the following steps 5-7 times: Settings > Music and turn on iCloud Music Library, select Replace or Merge (whatever you choose) and if you get this error, dismiss it and try again. Repeat these steps until it works. Some users stated that they did this over 10 times until they get it to work. Go to Settings > and turn on Airplane Mode and wait a few seconds and then turn off Airplane Mode. If you are still having this issue, you may need to restore your device. You can restore your device either from an iCloud backup or an iTunes backup. If your error message said ” iCloud Music Library can’t be turned on because this device is already associated with another Apple ID. This device can be associated with a different Apple ID in 90 days“, then you have no options. You need to wait 90 days. wrestling with same problem on both my apple devices (ipad / iphone) and Win10 PC – did they take it out ??? “My phone doesn’t have the ‘ICloud music library’ toggle at all, it just has a ‘downloaded music’ toggle.” Same. Suggestions appreciated.